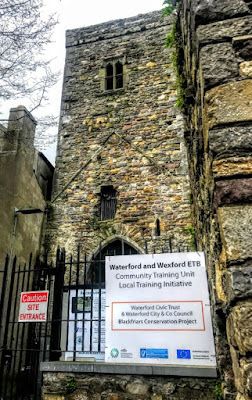 While I was visiting Waterford and Co Wexford at the end of last week, I was staying beside Saint Saviour’s Church, the Dominican Church on the corner of Bridge Street and O’Connell Street in Waterford. Saint Saviour’s Priory is home to a small community of Dominicans who engaged in the liturgical and sacramental life of their church. The Dominicans were founded as the Order of Preachers in 1216. 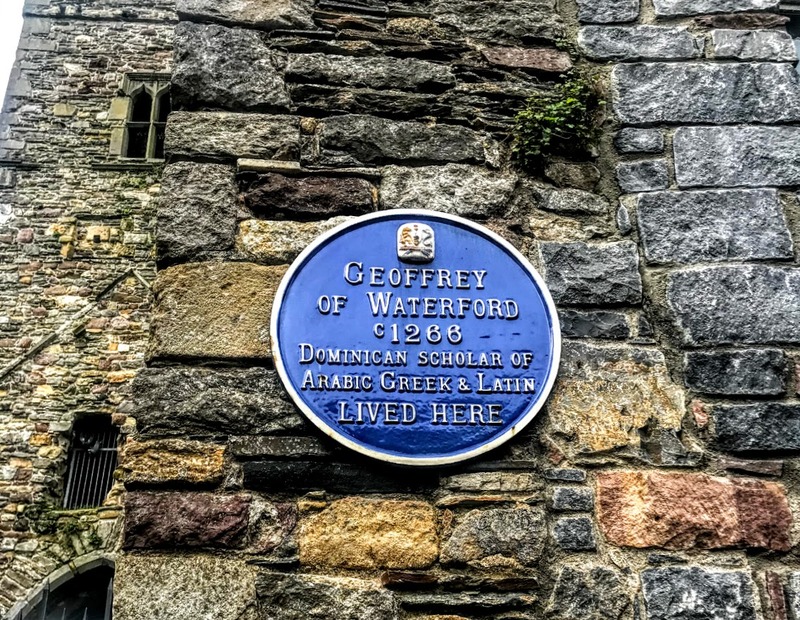 Their first foundations in Ireland were in Dublin and Drogheda, followed by the Black Abbey in Kilkenny, and they arrived in Waterford in 1226. The ruins of this mediaeval priory church still stand at Blackfriars, off Conduit Lane in the heart of the old mediaeval city. The response was spectacular and generous. Work on a new church began in 1874 and it was opened for public worship in late 1876. The church was consecrated on 2 December 1877 by Bishop John Power (1809-1887) of Waterford and Lismore, assisted by Archbishop Thomas Croke (1824-1902) of Cashel and Bishop William Fitzgerald of Ross. 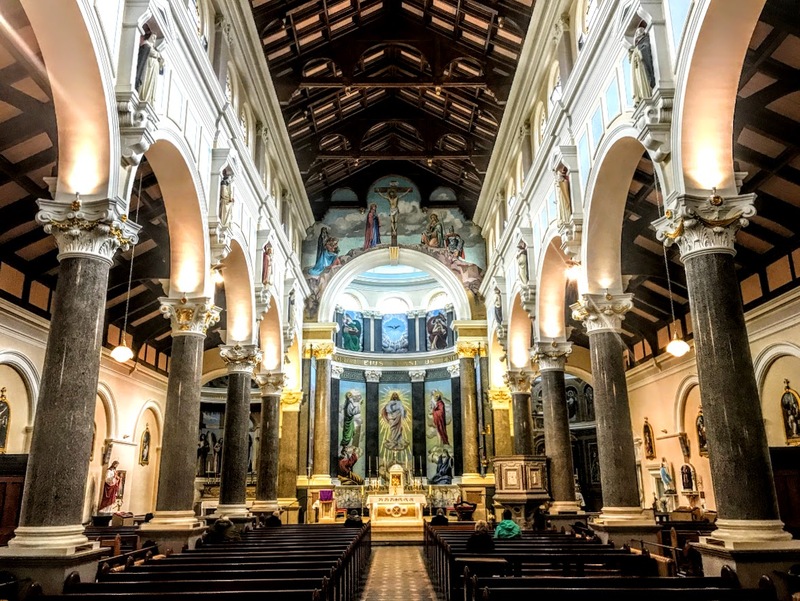 This church was designed by the English-born architect George Goldie (1798-1868), of Goldie and Child, who also remodelled the interior and exterior of Saint Saviour’s, the Dominican church in Limerick. 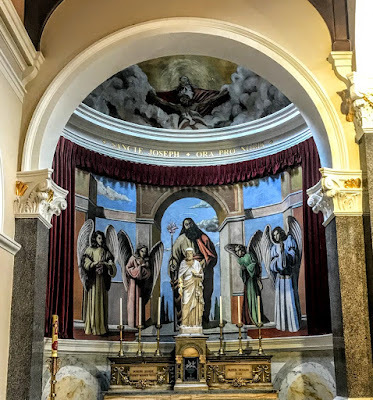 Goldie also designed the High Altar and reredos in the Redemptorist Church at Mount Saint Alphonsus on Henry Street, Limerick. Goldie was born in York, the grandson of the architect Joseph Bonomi the Elder. 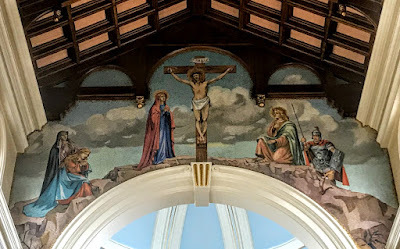 He was educated at Saint Cuthbert’s College, Ushaw, in Durham, and trained as an architect with John Grey Weightman and Matthew Ellison Hadfield of Sheffield, in 1845-1850, and then worked with them as a partner. 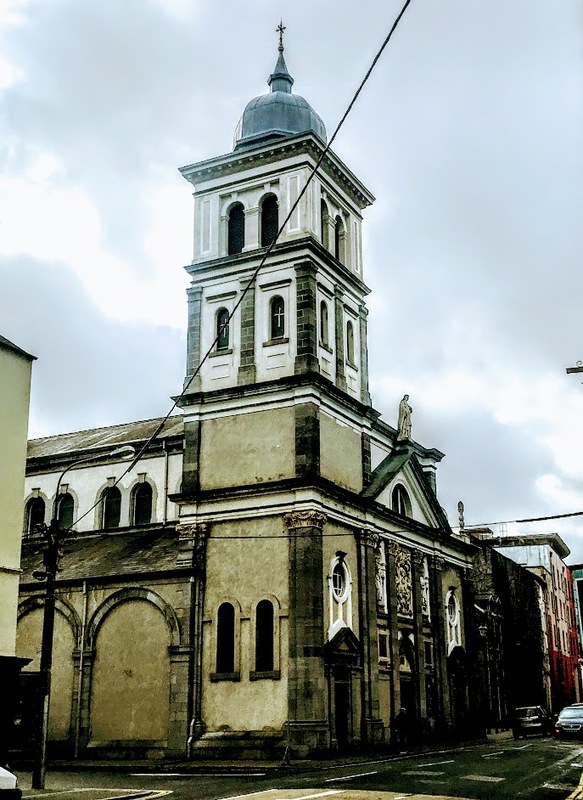 While Goldie was working on Saint Saviour’s in Waterford, he was joined in his architectural partnership in 1880 by his son Edward Goldie (1856-1921). Edward Goldie’s work includes Hawkesyard Priory in Armitage, near Rugeley and six miles north-west of Lichfield, built for the Dominicans in 1896-1914, and which I knew in my late teens and early 20s. There is no Saint Saviour, needless to say, and the full dedication of Saint Saviour’s Church, Waterford, is to the Most Holy Saviour Transfigured. This is a popular dedication for Dominican churches, with similar foundations in Dublin and Limerick, for example. 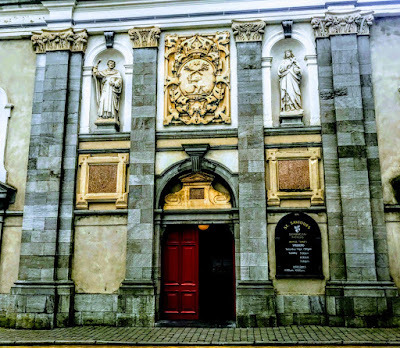 Saint Saviour’s Church on Bridge Street is a detached nine-bay double-height and triple-height Italianate, built in 1872-1880, on a corner site. It has an eight-bay, triple-height nave with eight-bay double-height lean-to side aisles on north and to south sides, a single-bay, five-stage engaged tower on the north-west corner on a square plan, and a single-bay, full-height bowed apse at the east end. The cut-stone work dressings throughout the church, particularly at the west front, show high quality stone masonry. Inside, the church retains many features of artistic interest, including stained glass panels and decorative plasterwork. The work on the roof is also of technical importance. This is a hipped slate roof that is half-conical above the apse, with clay ridge tiles, terracotta finials and cast-iron rainwater goods on cut-stone eaves. The tower on the north-west side has an ogee-domed lead-lined roof with a pinnacle to the apex. Outside, there are unpainted rendered walls to the nave with a moulded cut-stone cornice to eaves. The west front has a cut-limestone pedimented frontispiece with full-height Corinthian pilasters, panels with round-headed niches above that are filled with statues, a decorative heraldic shield, a plain frieze and a cut-stone surround to the pediment with statues on the apex. Other interesting features include a cut-stone blind arcade, cut-limestone full-height Corinthian corner pilasters on the tower, paired round-headed window openings forming a clerestory, and a Diocletian window at the tympanum on the west front. Inside, the church has a full-height interior that opens into the roof, carved timber pews, a Corinthian arcade to the side aisles on polished granite columns, decorative plaster work at the clerestory, an open timber roof supported on corbels and a round-headed chancel arch on paired columns. The granite for arches came from Penryn, Cornwall, and the church was built by Ryan & Son at a total cost of £11,000. 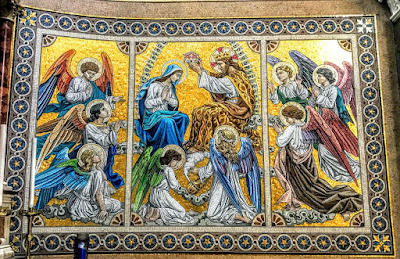 The official dedication of this Church is to the Most Holy Saviour Transfigured, so it is appropriate that the seven mosaic panels around the High Altar include three central panels depicting the Transfiguration show the Transfigured Christ with Saint Peter, Saint James and Saint John, with Moses and Elijah above them. The decoration of the apse was designed by Ashlin and Coleman, the architectural practice that continued the work of the Pugin family. The mosaics executed by Ludwig Oppenheimer of Manchester around 1915. The company was founded by Ludwig Oppenheimer, who was born into an Orthodox Jewish merchant family in Germany. 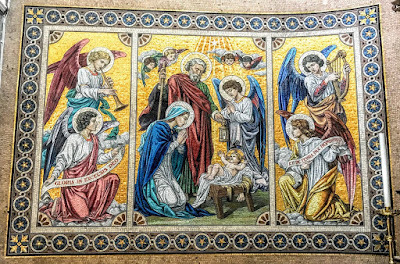 He converted to Christianity and learned the art of mosaics in Venice. 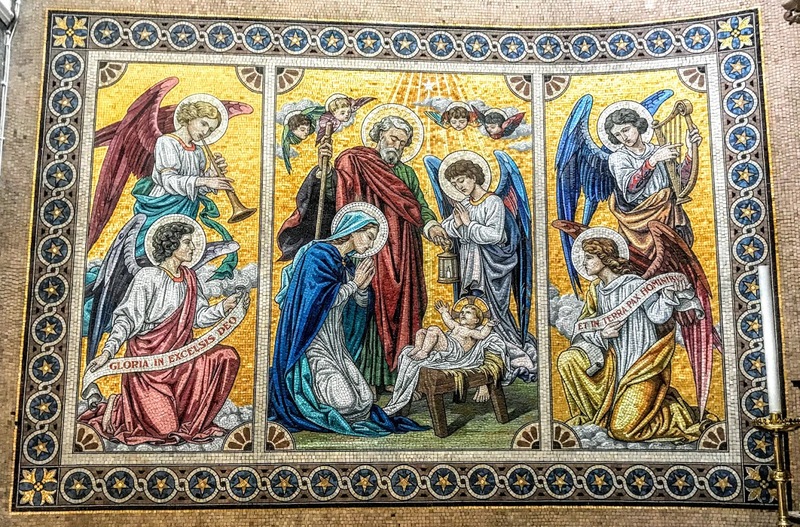 He established a mosaic business in Manchester and worked with many of the leading Gothic Revival church architects of the day, including George Ashlin and JJ McCarthy. 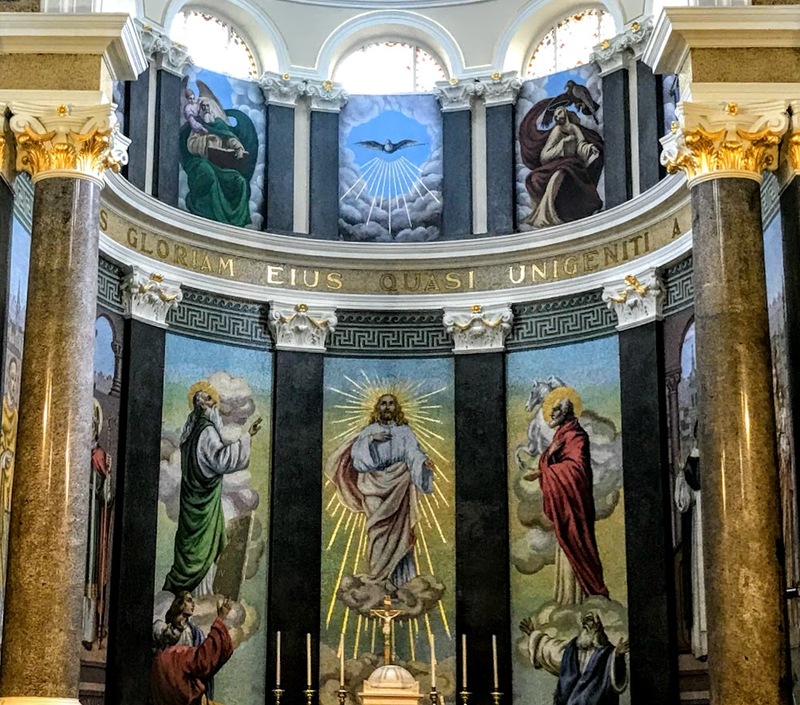 It is said in Waterford that the original cartoons for these mosaics were drawn by an Irish Dominican, Father John Heuston, a brother of the 1916 rebel leader, Sean Heuston. The four side panels depict local saints and events. 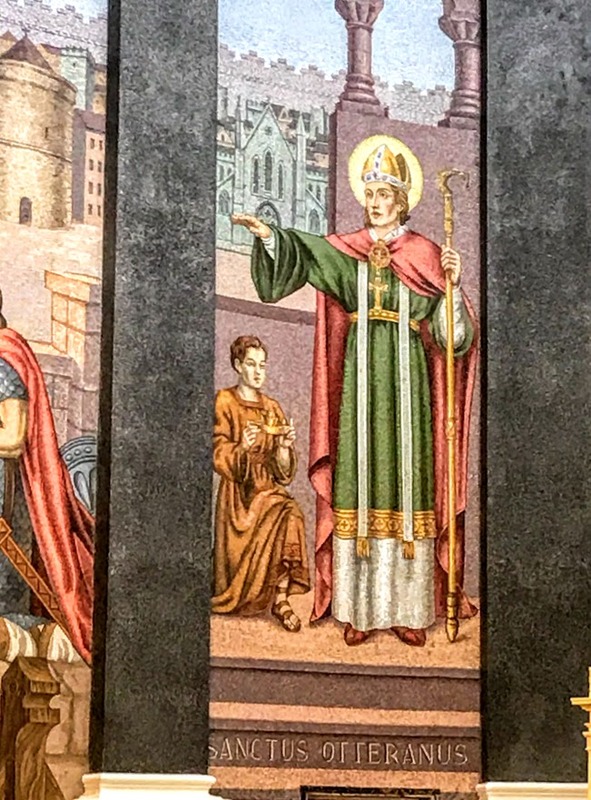 On the left, Saint Otteran is baptising a Viking chief in front of Reginald’s Tower – although Saint Otteran never set foot in Waterford, the Vikings were devoted to him and he is one of the patron saints of the Diocese of Waterford and Lismore. 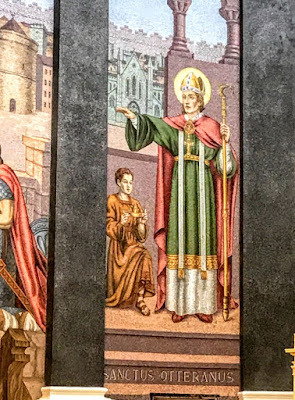 Here too is Saint Declan of Ardmore, with Holy Trinity Cathedral on Barronstrand Street behind him. On the other side of the High Altar, the panels depict a standing and a siting Dominican friar. 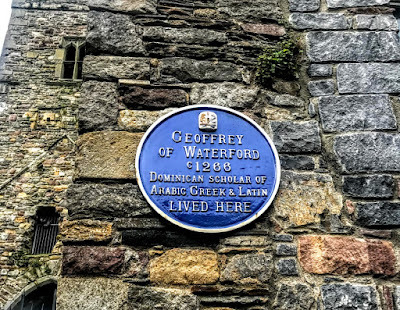 The standing figure is Father Geoffrey of Waterford, one of the first Dominicans in Waterford, a scholar who translated the Bible and other sacred texts into Arabic, Greek and Latin. The seated figure is probably Father John Heuston. Behind them is Saint Saviour’s Church. Above these mosaics, five frescoes depict the four evangelists, with the Holy Spirit in the centre. Other features inside include the carved altar furniture, the pilasters at the apse and the decorative plasterwork on the ceiling. The central aisle is flanked by 12 pillars. Above the ornamental capitals at the top of these pillars are statues of 12 Dominican saints sculpted by the Birmingham stonemason James Pearse (1839-1900), father of Patrick and William Pearse, leaders in the Easter Rising in 1916. The chapel in the north side aisle is dedicated to Saint Joseph. 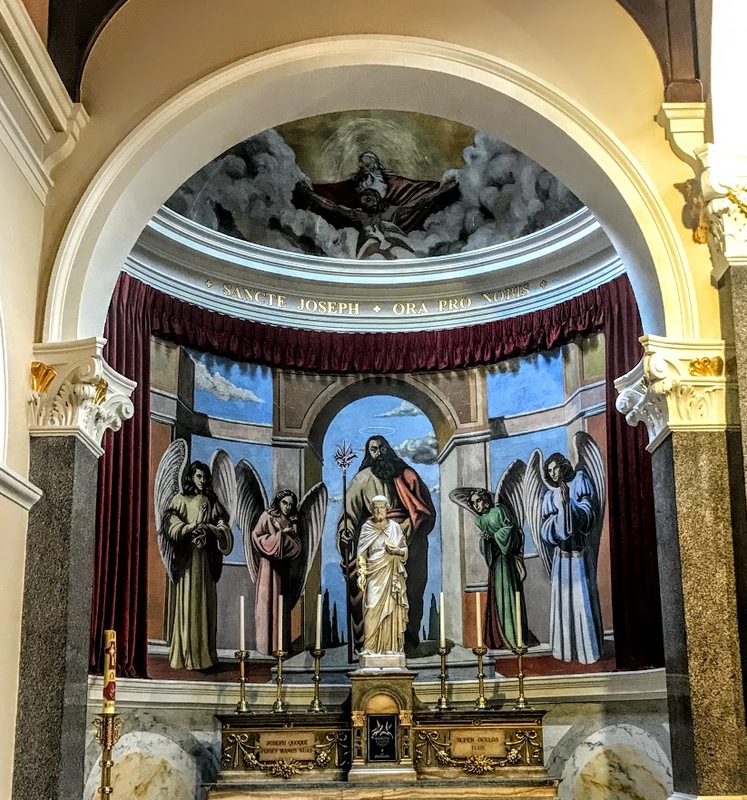 The fresco painted by the Irish Dominican, Father Aengus Buckley, shows Saint Joseph surrounded by four angels. Four local Waterford girls sat as models for the angels. 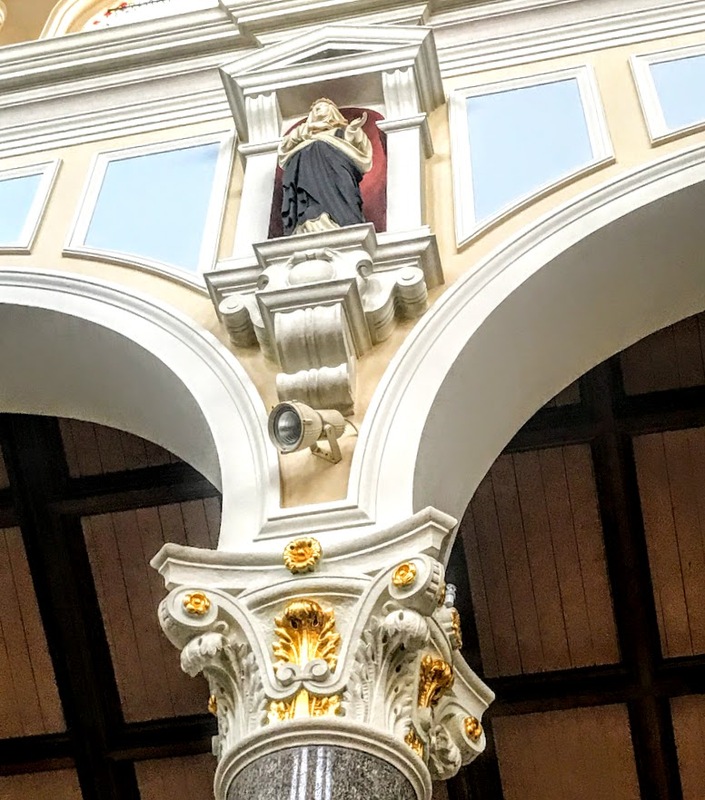 A statue in the chapel on the south side depicts the Virgin Mary giving the rosary to Saint Dominic and Saint Catherine of Siena. 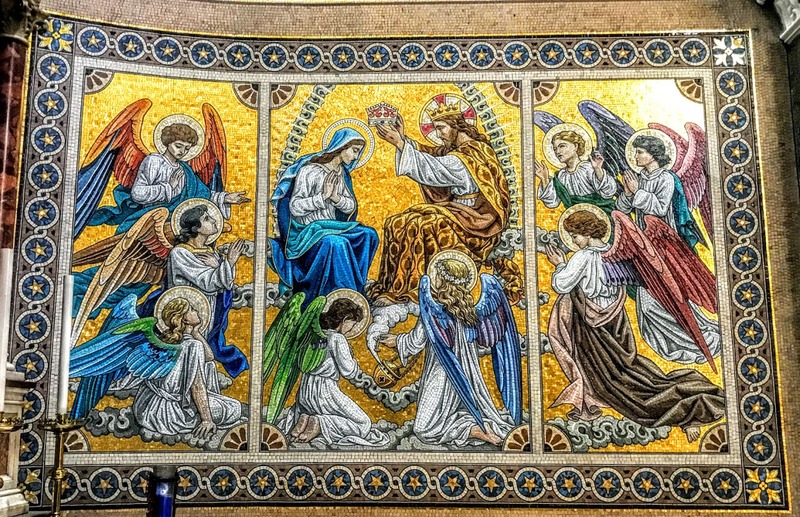 The two mosaics on the side walls of this chapel show the Nativity and the Coronation of the Virgin Mary. The three icons above the central doorway inside the church depict Christ Pantocrator between the Virgin Mary and Saint John the Baptist. 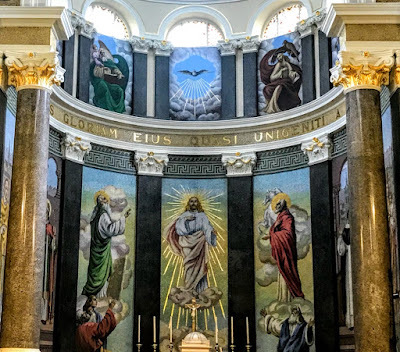 They were commissioned by the late Prior, Father Jim Harris, and are the work of the Romanian iconographer Mihai Cucu, who also wrote the icons in the Lady Chapel in Christ Church Cathedral, Dublin. Although Saint Saviour’s Church was condemned in the late 20th century, it has survived. 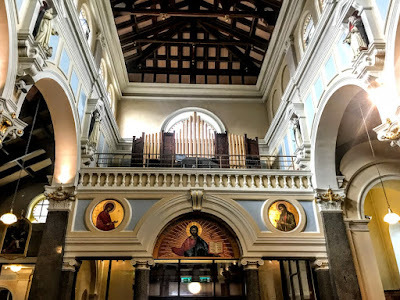 It was consolidated, and since then the church has been well maintained, retaining most of its original form and character, and many of its original features and materials. With its tower, Saint Saviour’s Church remains a prominent landmark on the streets at the west end of Waterford.